Or should I say CompletableFuture ? 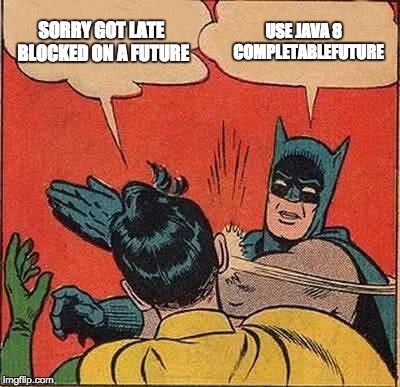 The Future interface was first introduced in Java5, but until Java8 it offered pretty limited functionality with the caller of the future, getting blocked when trying to retrieve the result of an asynchronous operation performed by the future. Now we can all agree that blocking is not a good thing! So Java8 comes to our rescue & adds the capability to register a callback (amongst others) to your future. This way we are not bothered about when the future is finished and that is the way it should be. // Get the result of the future - Blocking call ! That is, one must delay calling get on the Future until it was absolutely necessary. The problem with this approach is that the caller may not know how long to wait before blocking on the future. A CompletionStage should be seen as a single unit of asynchronous operation in a pipeline of such async operations. It could be as simple as a callback which needs to be executed once a Future returns as seen in the above example. CompletionStage provides several methods to specify the dependency on completion of a previous stage like thenAccept, thenApply, thenCombine, thenCompose and their async versions ( more on this below ). There are approximately 50 different methods that CompletableFuture provide to handle various use-cases; we discuss the most common below. The computation performed by a Stage may be expressed as a Function, Consumer or Runnable ( using methods with names includes apply, accept or run respectively ) depending on whether it requires arguments and/or produces results. The golden rule is that if you want to chain multiple operations then use a Function instead of a Consumer as Consumer does not return anything but a Function can. Notice how we are using thenCompose in the above code snippet instead of thenApply or thenAccept The reason for this is that thenCompose has the capability to wait on the passed function ( it takes as an argument of type CompletionStage and can wait for it to complete) but others do not take a CompletionStage. Hence they cannot wait for the completion of a passed future. This means that you can pass a future to thenAccept or thenApply but you cannot ask to wait on those futures to finish. Another difference between thenApply & thenCompose is similar to that the difference between map & flatMap as in the Stream world. If your callback function returns a CompletableFuture, and you want a flattened result from the CompletableFuture chain (which in most cases you would), then use thenCompose. One stage’s execution may be triggered by the completion of a single stage, or both of two stages, or either of two stages using the various method it provides. custom execution (via a supplied Executor). In the default execution mode, all the callbacks are executed on the same thread. Whereas, in the default asynchronous execution mode, the callbacks are submitted to the common thread pool instance – ForkJoinPool.commonPool(). The third variant of the APIs allows you to supply a custom Executor of your choice if the default pool is not good enough for your use-case. Once we understand these functional interfaces, the following tables groups together the most frequently used APIs and relate them with these interfaces. It must be noted here that async variations of these methods and variations taking a custom Executor of these methods are not listed in the tables below for brevity. Congratulations if you have made it so far. This was a pretty long post but was necessary to cover the various aspects of asynchronous execution that CompletableFuture provides. The complete source code for all the examples in the blog post can be found here. CompletableFuture is an excellent addition to a developer’s concurrency arsenal and although it may seem daunting to use, at first, it provides us with a way to write elegant and non-blocking asynchronous code once you get a hold of its APIs. Update: Java9 adds support for subclassing, new factory methods and supports for delays and timeouts to the CompletableFuture but that probably calls for another blogpost!